Drain the apricot juice and reserve 4 ounces in a bowl. Microwave on high for 1 minute. Add the raspberry gelatin mix and stir until dissolved. Refrigerate until chilled in a shallow container. Turn the jelly out onto a wet surface and with a wet knife, chop it into small dice. [Do you reserve 4 ounces of apricot liquid? Or do you add water to make this amount? When do you use water?] In a separate bowl, mix together the yogurt and the vanilla extract until they are well blended. Slice up all but one apricot half. 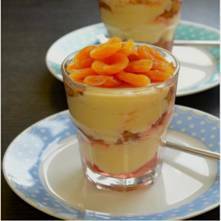 Layer the jelly, apricot slices and yogurt mixture in a large glass. Decorate with an apricot half and a cherry. Enjoy!